It’s been a weird tournament so far for U.S. Open chair umpires. Less than a week into the tournament, chair umpires—whose goal is to be an unobtrusive as possible—have been directly responsible for launching two huge controversies: First, a chair ump needlessly penalized Alize Cornet for changing her shirt on court, which turned into a Whole Thing. Then yesterday, chair ump Mo Lahyani appeared to give master tanker Nick Kyrgios a pep talk in the middle of his match against Pierre-Hugues Herbert. Kyrgios went on to win and that has turned into an even bigger Thing. If chair umpires are going to factor into a match, it should be for something goofy and lighthearted, some physical comedy perhaps, like getting drilled in the face with a tennis ball. No, no, that was pretty bad actually. What about toppling off the umpire chair? 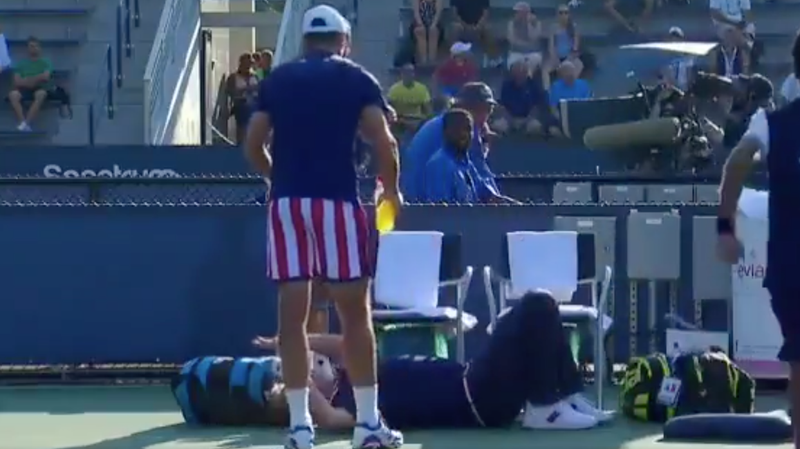 During Fabio Fognini and Simone Bolelli’s three set win over Germans Kevin Krawietz and Maximilian Marterer in the first round of U.S. Open doubles on Wednesday, chair umpire John Blom took a tumble. The umpire himself responded to a concerned fan on Twitter.